Algorithm to estimate the most prominent pitch of a vector of Real values reprsenting the FFT of an audio frame using the Autocorrelation function. This class represents an object to estimate the most prominent pitch of a vector of Real values reprsenting the FFT of an audio frame using the Autocorrelation function. The algorithm performs an autocorrelation on the input spectrums and finds the first peak of a set of highest magnitude candidates. 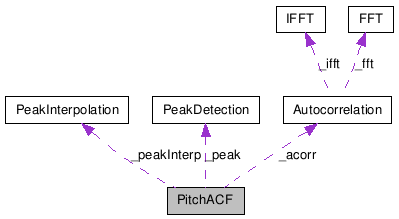 The index of the peak and the values of the peak will determine the pitch frequency and saliency. The minimum peak width can be specified using setMinimumPeakWidth(). The number of candidates at the peak detection stage be specified using setPeakCandidateCount(). Constructs an autocorrelation based pitch estimation function object with the specified fftSize, samplerate, minPeakWidth and peakCandidateCount settings. fftSize size of the input FFT frames, must be > 0.
samplerate the samplerate of the input signal. By default it is 1.0, so the pitches will be returned in normalized frequencies. minimumPeakWidth the minimum width of a peak in the autocorrelation function for it to be detected. peakCandidateCount the number of highest magnitude candidates to be considered during the peak detection process of the autocorrelation function. References setFftSize(), setMinimumPeakWidth(), setPeakCandidateCount(), and setSamplerate(). Performs a pitch estimation on each of the rows of spectrums. Puts the resulting estimated pitches in the rows of pitches and the saliencies of each pitch in the rows of saliencies. spectrums matrix of Real values representing one spectrum magnitude per row. The number of columns of spectrum must be equal to the fftSize / 2 + 1 where fftSize is specified using setFftSize(). pitches pointer to a matrix of Real values representing the frequencies of the estimated pitches as rows. The matrix should have the same number of rows as spectrums and as many columns as the count of estimated pitches. Note that this algorithm is only capable of detecting a single pitch at each frame, therefore pitches will be a single column matrix. saliencies pointer to a matrix of Real values representing the saliencies of the estimated pitches as rows. The matrix should have the same number of rows as spectrums and as many columns as the count of estimated pitches. Note that this algorithm is only capable of detecting a single pitch at each frame, therefore pitches will be a single column matrix. Note that if the output matrices are not of the required sizes they will be resized, reallocating a new memory space if necessary. References PeakInterpolation::process(), PeakDetection::process(), and Autocorrelation::process(). Returns the size of the FFT that has been performed for the input. The default is 1024. Specifies the size of the FFT that has been performed for the input. The given size must be higher than 0. Returns the minimum width for a peak to be detected in the autocorrelation function. The default is 6. Specifies the minimum width for a peak to be detected in the autocorrelation function. Returns the number of highest magnitude candidates to be considered during the peak detection process of the autocorrelation function. Note that if the value is <= 0, then no preselection is performed and all detected peaks are considered as candidates. By default it is 6. Specifies the number of highest magnitude candidates to be considered during the peak detection process of the autocorrelation function. Return the samplerate frequency of the input signal. The default is 44100.0. Specifies the samplerate frequency of the input signal.